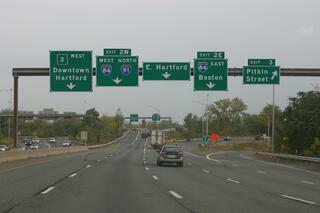 According to the DMV all roads are “highways” and are part of the “Highway Transportation System”. Confusingly enough, common vernacular labels only large “main” roads such as The Interstate Highway System as highways. Regardless of what you call them, new drivers are often intimidated by these kinds of motorways. The larger number of other cars, multiple lanes, and higher speeds all add up to nervous newbies behind the wheel. Ironically, as experienced drivers can verify, highway driving is actually often easier than forging a path on some of the back roads that permit-holders will cut their teeth on. That said: when you’re first learning how to drive, don’t jump on a highway right away. Your best bet is to take it slow and stay in parking lots until you can easily control all aspects of the car and can react to sudden developments. Once you’ve been out a few times and feel confident maneuvering the vehicle around, hit the main roads during the day. One of the most important things for main road driving you can learn is checking your blind spots. Many new drivers have trouble with this, as the idea of taking your eyes off of what is in front of you seems scary and counterintuitive. Regardless, it’s vital to not crash into other cars on multi-lane roads! To check your blind spots successfully when you want to come off a curb, merge with traffic, or before you change lanes, perform what we at The Next Street call a “3-point check”: glance at your rear view mirror, the appropriate side view mirror on the side you’re looking to go, and then at your appropriate blind spot through your back door window (not your back windshield, the back door window). Don’t rush it! While the 3-point check should be performed promptly, many new drivers panic and don’t really think about what they see when they check and end up missing important information: like a car barreling down on them! Driving on back roads isn’t hard: they can just be confusing as they twist and curve and if you’re unfamiliar with them they can seem pretty intimidating at first. 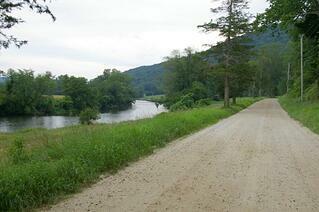 Connecticut back roads are traditionally considered (sometimes unfairly) as the worst kept roads in the country. Regardless of the validity of the stereotype, driving on them can certainly give one the impression that potholes are the biggest threat the nation is facing at the moment. The real threat facing you on back roads often is other drivers. Too commonly when drivers are familiar with an area of back roads they’ll speed through them without thinking of the danger they are creating for the less-experienced. Don’t be intimidated by these individuals. Don’t sweat it if they are tailgating you. They are the ones with the problem, not you! You’re not in the wrong taking it slow and if they want to roar over the speed limit it’s their neck on the line when the police catch up with them. Don’t sugarcoat your training: drive in parking lots when you’re first starting out and work your way up from there, but don’t spend endless hours there. If you’re not challenged, maybe even a tad bit nervous, you’re not learning! Master checking your blind spot with the “3-point check” technique. 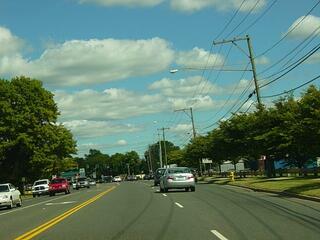 It’s vital for things like pulling off a curb, merging with traffic, and changing lanes. Remember: rear view, side view, blind spot. Take it easy on back roads to begin with. Folks familiar with them will speed, it’s enviable, but don’t take their example to heart or be intimidated. 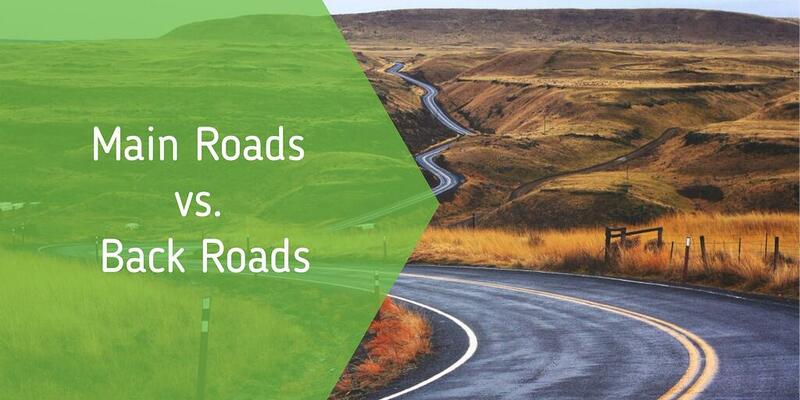 Now that you're armed with some MIGHTY KNOWLEDGE about main roads vs. back roads, Go Ahead and get our there and conquer them! Want to learn how to master those roads from the pros? Take a driver's education class with The Next Street and get the confidence you need!